As physicians, the health of our patients is always our first consideration. But unfortunately, patients aren’t always permitted to benefit from the treatment plan that physicians prescribe. Some patients are forced to try one or more medications that end up not helping them before insurers will allow the recommended treatment path. This process is called “fail first” or step therapy, and is intended to control costs associated with prescription drugs by starting with less expensive drug therapies and then progressing to other costlier therapies only if necessary. Most physicians aren’t opposed to lowering costs, and the best way to control rising prescription drug costs has been debated for many years. However, step therapy often undermines our judgment and discretion and places patients at risk unnecessarily. Instead of focusing on what we think is best for our patients, priority is given to medications which may cost less in the short term, but also which may be less effective than what we’ve prescribed. For patients diagnosed with moderately active Crohn’s disease or ulcerative colitis, step therapy requires multiple follow-up appointments over 3 to 6 months, after which time we can again request our first choice of therapy. Then, another appointment is needed to initiate the new medication once it is approved. Throughout this months-long delay, the patient remains ill and the disease worsens, perhaps creating a long-lasting impact on the patient’s health. Efforts are underway at the state and federal levels to change this practice. More than a dozen states have passed step therapy reform (for state-regulated plans) in recent years and more are considering similar legislation. In Georgia, where we practice, State Rep. Sharon Cooper (R-Marietta), State Rep. Bruce Broadrick (R-Dalton), State Rep. Penny Houston (R-Nashville), State Rep. Matt Hatchett (R-Dublin) and State Rep. Darlene Taylor (R-Thomasville) have introduced H.B. 519, which will require health benefit plans to use clinical review criteria to establish step therapy protocols and to provide a better process for determining when step therapy should be overridden. At the federal level, 2 physicians, U.S. Rep. Brad Wenstrup (R-Ohio) and U.S. Rep. Raul Ruiz (D-California), have proposed legislation to bring protections to those who have federally regulated insurance. The “Restoring the Patient Voice Act” (H.R. 2077) will give healthcare providers the final say in how to treat their patients. Under the proposed federal bill, the step therapy process would become more transparent, requiring health plans to provide a reason for denying a prescription drug – and cost cannot be the only basis for the decision. Patients and their doctors would also have the option to override the decision if the treatment option identified by the insurer is likely to be ineffective based on the patient’s medical history or clinical practice guidelines. H.R. 2077 does not ban the practice of step therapy, but rather provides a clear process to appeal these decisions, and ensures that the most appropriate treatment options are available for doctors to prescribe. It does not limit the number of steps that can be required, or ban prior authorization for medication, but rather makes the process more transparent and avoids undermining clinicians’ medical expertise in diagnosing and recommending treatment protocols for patients, rather than simply relying on a preset formulary. Physicians are driven by a responsibility to protect the health of our patients and communities. Our policymakers in Georgia and the U.S. Congress can help us fulfill our duty and the oath we took to put our patients first by reforming “step therapy” policies and allowing our patients to benefit from the treatments we prescribe on a timely basis. 1. Farley J, et al. Retrospective assessment of Medicaid step therapy prior authorization antipsychotic medications. Clin Ther. 2008; 30(8):1524-39; discussion 1506-7. doi: 10.1016/j.clinthera.2008.08.009. 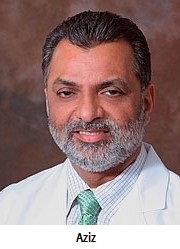 Arif Aziz, MD, is a practicing gastroenterologist at GI Specialists of Georgia in Marietta, with locations throughout Northwest Georgia. Dr Aziz is an executive committee member of the Digestive Health Physicians Association (DHPA) and serves as chair of its data analytics committee. Marc Sonenshine, MD, is a practicing gastroenterologist at Atlanta Gastroenterology Associates, with locations throughout Metro Atlanta and North Georgia. Dr Sonenshine is an executive committee member of the Digestive Health Physicians Association (DHPA) and serves as chair of its communications committee.